Let’s get real: sometimes it can feel like it’s a jungle out there. The earth naturally grows all types of plants—some friendly, and some dangerous. And depending where one lives, it can be even more dangerous to go picking around through the plants nearby. That’s why it’s crucial as parents that we introduce our kids to the various plants they may find in the backyard or nearby, teaching them which ones are a happy find and which are a harmful find. We know. Everyone knows what poison ivy is and what it looks like. Poison ivy has three leaves with red coloring in the center where the leaves come together and, like any ivy, it’s found on a vine. But we want to make sure our kids know that it might not always grow in this stereotypical state. Sometimes, poison ivy can be found creeping up tree trunks in long, squiggly, brown vines—which also contain the skin irritant most of us are allergic to. Another fact to point out is that sometimes homeowners might confuse poison ivy or poison oak with Virginia creeper, thinking it’s safe to remove without gloves. Keep in mind that these plants look pretty similar, so you (and your kids) need to know what to really look for. Even if that means making a quick Google search before touching a vine. Our family loves a good strawberry rhubarb pie. It’s the perfect combination of tart and sweet—and the color is out of this world. But you want to be careful if you’re growing rhubarb in your own vegetable garden. Although the bright red/pink stems are perfect for eating, the leaves can actually be fatal! We wouldn’t want our rhubarb lovers getting into a batch of the leaves, so it’s important to teach them how dangerous it can be—or to keep that garden item out of reach, altogether. Those who live near the water might be unpleasantly surprised to find water hemlock in their backyard. This plant is very unassuming with its dainty white flowers and thin stems—but don’t be fooled. Eating or even touching the root can cause toxins to enter your body, possibly even leading to death. That’s something you don’t want the kids messing with, so make sure they’re well aware of the danger. Daffodils are a common spring favorite—with good reason. Their bright colors, soft petals, and vibrant cups are an amazing sight to help welcome in the new season. But their bulbs are surprisingly poisonous to humans. And, while it may not seem like a big deal, it can be. After all, your kids probably love smelling these flowers. What happens when they dig around in the yard and uncover bulbs that slightly resemble onions and garlic, all while connected to a beautiful flower? Kids can be tempted to eat almost anything, and especially when they’re playing “chef” and making a special collection of mud pies in the backyard. Make sure they know these bulbs are off limits. If they want to come in and really cook, there’s plenty of real food inside! 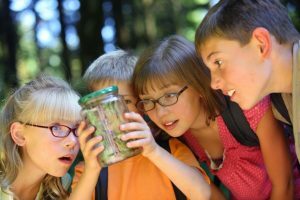 While we are always advocated for getting the entire family outside and active, it’s important that we educate our children on the potential dangers that may be present in our own backyard gardens! One safe way to enjoy the great outdoors? With a JumpSport Backyard Trampoline! We place a great deal of attention on the safety of all of our products and ensure a safe, healthy, fun time for all! Contact us today to learn more.